Yesterday I tried a new technique while wire wrapping. For most of my pieces I start by cutting four one-foot pieces of wire and connecting them at the very end to start my loop. I allow the loop to flow into the piece. The new technique I tried was very different. 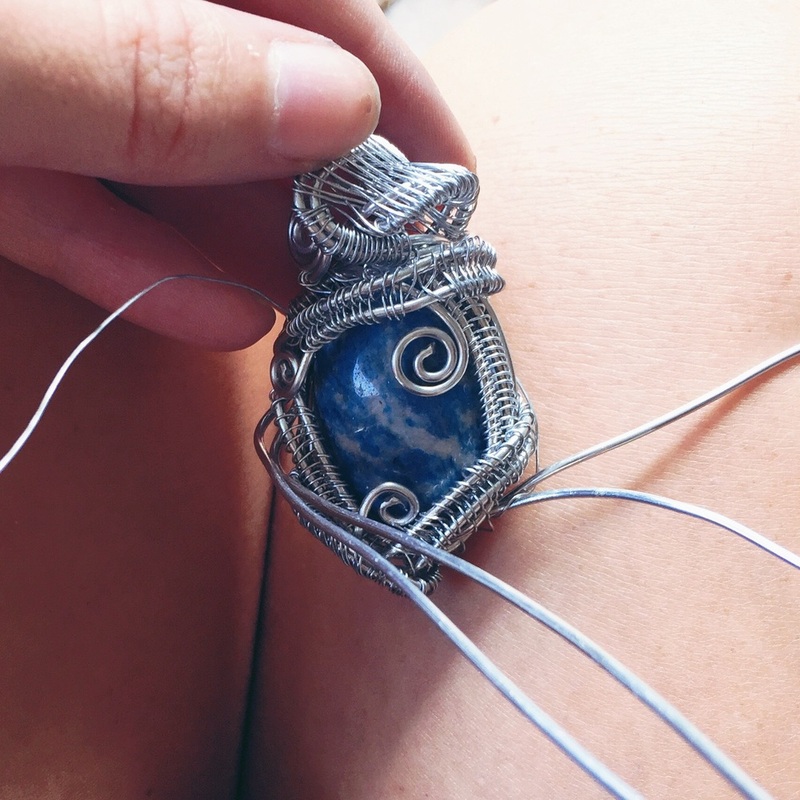 Luckily I remembered to capture my process for those of you who have been asking how to wire wrap. I learned through practice, through callusing my fingers, through messing up multiple times, through learning what works for me specifically. I do not believe art is something that can be "taught." 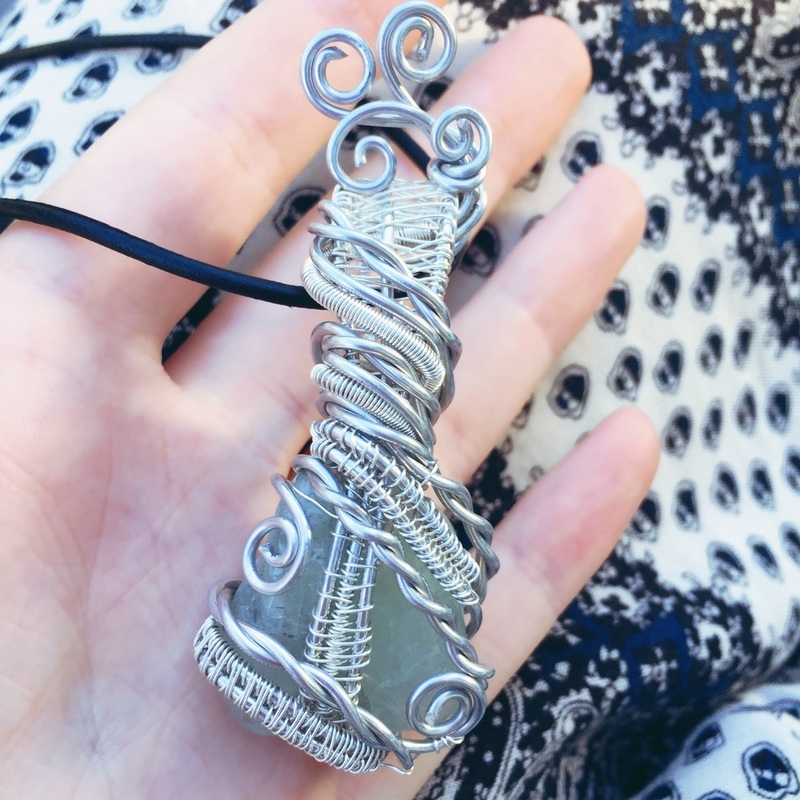 Wire wrapping to me is about finding your "flow", finding your own technique, and finding your own style. In this tutorial I will be very brief because each stone is different. You must let the energy of the stone carry you throughout the artistic process. Wrapping should be like a puzzle - determining where to put each piece of wire, what weave will best lock the wires in place, etc. Without me being there with you to see the shape and size of the crystal, this is the best I can do. I truly hope this bit of information and these pictures are helpful! Step One: Cut four long (16-24 inch) pieces of base wire. I use 16 gauge, but many people will use 18 or 20 (thinner sizes) for finer detail. Step Two: Cut one very long piece of the thin wire you will be using for weaving. I usually cut a five foot strand, but end up needing more. I use 28 gauge wire for weaving, which is the thinnest I've been able to find. I love working with 26 gauge as well. 24 is normally too strong for attractive, tight weaves. Step Three: Wrap the thin wire around the center of all four pieces so they stay together. From here you will begin your weave. This will be the bottom of the pendant. The easiest technique in my opinion is to go over and under two pieces of wire with the thin wire. Make sure you are pulling the wire tight each time. With the thin wire start from the outside of the thicker piece, pull down into the middle, and pull out the other side, go over the outside piece of thicker wire, down into the middle, and out the other side. It is very basic weaving and after you learn this step, you will be on your way to playing around with other weaving styles. Step Four: After you have began weaving this side of your wire base, hold it up to the stone how it will sit. See what your next move is. You should pay attention to how you are going to hold the stone in place, what wire will move behind the stone to create a cage, and how you will begin your loop. The loose ends that come up to the top do not have to continue to circle the stone, you can put those pieces of wire around to the back of the stone, come around the side, whatever feels right. Like I said before, wrapping is like a puzzle and should be done by finding where each piece goes until you have it in the right spot. Step Five: Weave the other side of the base where you began your first weave (the bottom of the pendant. You can try a new weaving technique, use all four (or as many as you want) of the thick pieces of wire. Step Six: Once you have been weaving for a while, hold the stone up again. Can you begin a loop? To create the loop, you will start from the back and put something between the stone and loop to make a hole. With that piece you will come around the front and find a way to assemble those pieces of wire so the loop will stay in place. Step Seven: It helps lock the stone and wire in place if you come back up and wrap the loop with excess wire. Step Eight: Continue weaving and wrapping as much as you would like. Once the stone is in place it is up to you to create the amount and type of detail you want. To end a piece of wire, I create a swirl or tie it in the back of the loop so the loose end of the wire is not visible. To create a swirl, use needle nose pliers at the very tip and do small bends with your wrists until you have reached the desired effect. Use wire cutters to cut any loose ends you don't need. You can use leftover thin wire still attached to weaves to hold the swirls in place. Lapis Lazuli (small royal blue), Rose Quartz (round pink stone), Smoky Quartz (round glowing dark yellow stone), Citrine (white to yellow point), Black Tourmaline (black stone ((hidden almost!! )), Blue Kyanite (lighter blue shard). These are the stones I like to carry with me. Sometimes I switch it up, but I often find myself with these six. Even though I am not wearing them or showing off their beauty, I feel good knowing they are always with me. 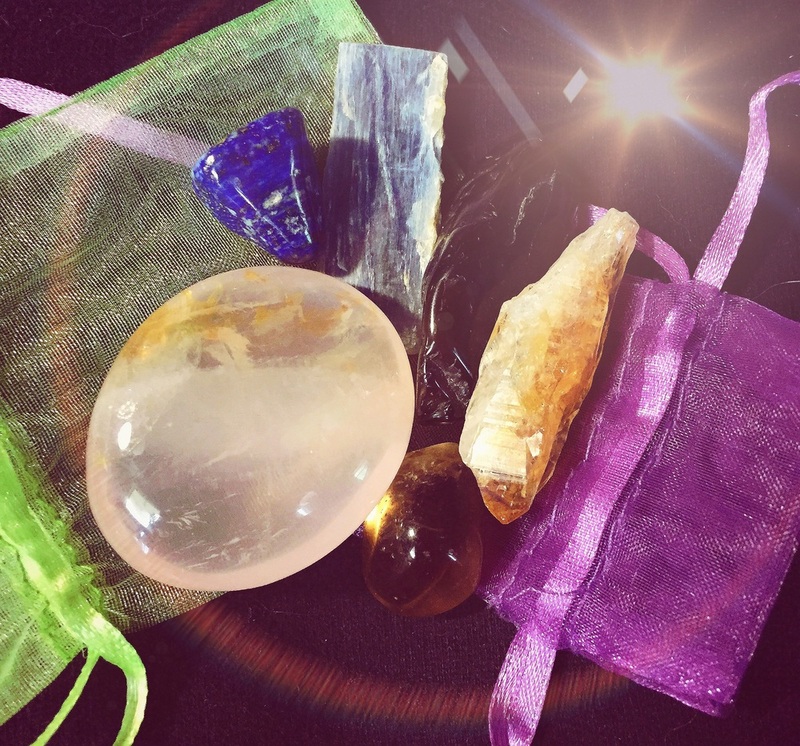 Whether it's in my pocket, my purse, or my pillow - these stones are there to protect, help, and heal me. I carry the Rose Quartz because of how happy it makes me feel. Every time I hold this stone it makes me feel so at peace with everything. It takes all my worries away and directs my attention to the wonder that lives inside. I carry it because it means something to me. It makes me feel loved and reminds me I am loved. It was a gift to me from Vero at The Bodhi Tree in Sugarloaf, NY; the place I did my first custom show. This crystal shop is more like a spiritual getaway and Vero is a warm, gentle person who is lovely to be around. I carry the Rose Quartz because it makes me feel safe, like nobody can or will bring me down. I feel like my heart is protected, so I am able to see the best in everybody and give my love to them. I carry the Black Tourmaline for protection. I feel it protects me spiritually and emotionally. It relieves me of any panic, worry, and fear. It helps ground me spiritually so I am not fatigued or drained. I carry it because it is one of my favorite stones. It was a gift from my mom who is also my best friend. She knows me better than anyone. I know she spent so much time picking out crystals for me when she went to Puerto Rico. I couldn't wrap or sell any because of how much I loved them all. We are always on the same wavelength. 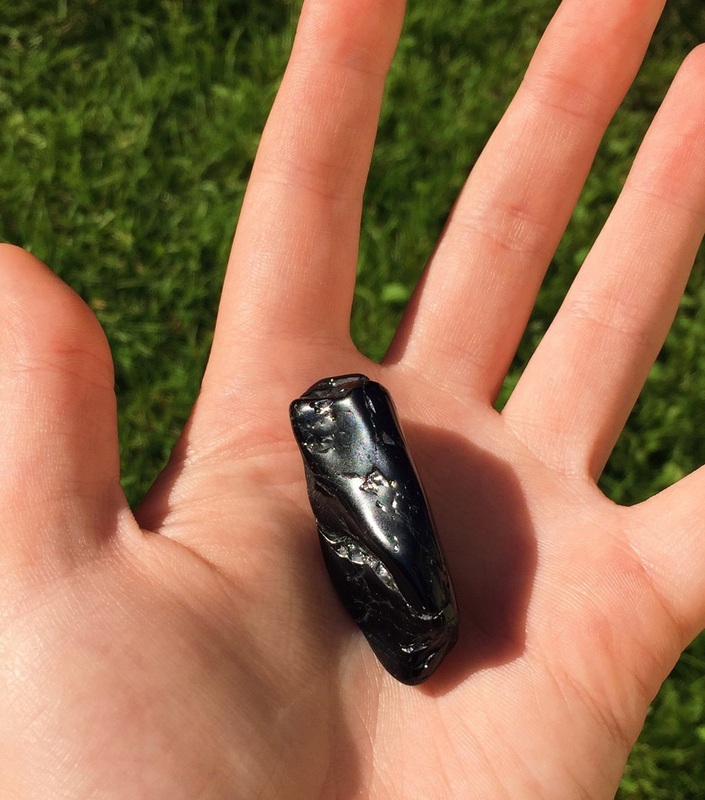 She has always been my main protector, but if she is ever not with me - the protecting properties of black tourmaline are. Why wouldn't you carry one of these? I carry the citrine because of the properties. 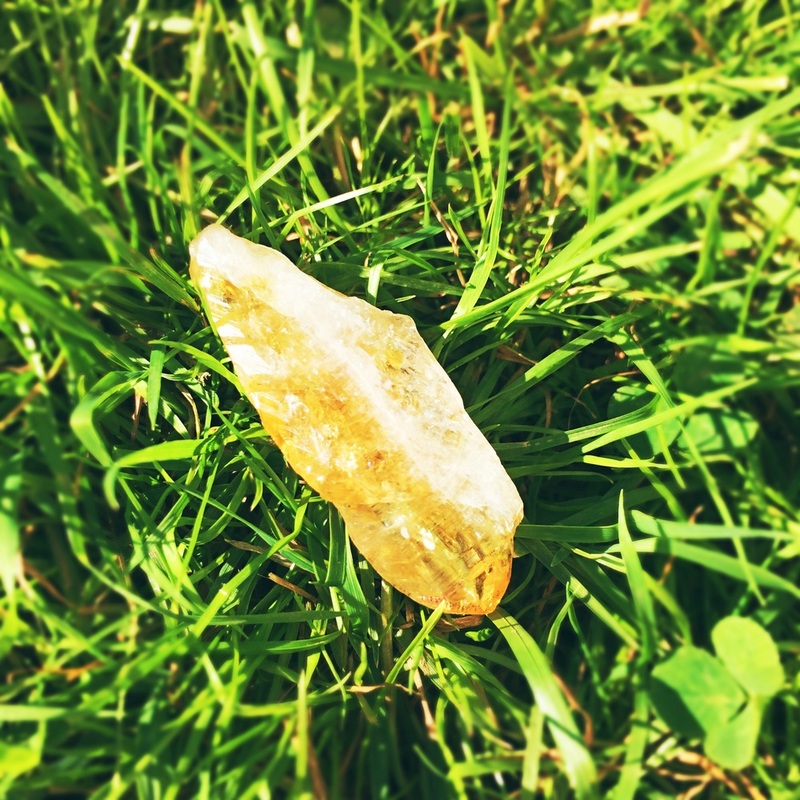 I have never had any special memory with this citrine or any citrine - but I love what it is meant to bring. It is a stone of abundance, of prosperity, and of luck. It is a manifestation stone for ideals, dreams, and goals. It is a stone of joy, bringing optimism and positive thoughts. It dissolves any negative energy, protects against negative energy, and holds no negative energy. It is a stone of control. It fills the Solar Plexus Chakra with power, anxiety relief, and trust. It clears any blocks and let's you beam with yellow light. Can feel my happiest moments when I look at this stone. I carry the Smoky Quartz because it is another great protection stone. I especially love that it is protective during travel. I bought this in the summer of 2014 - a summer of adventure! I drove to Delaware for a music festival (Firefly!!) filled with late nights and laughter, Tennessee to stay on a house boat for a week for full relaxation and fun, New Jersey to visit my cousin for a crazy night at a rap concert (Eminem), Connecticut for an awesome concert (Queen!) and such a fun night, and more. It was nonstop travel and adventure. Smokey Quartz protects against road rage, harm from other drivers, and traffic or road issues. I carry it for safety - and for all the memories of such good times. I carry the Lapis Lazuli and the Blue Kyanite for communication. One to help me listen and one to help me speak. One to dissolve the negative thoughts and one to bring in wise, intelligent ones. One to help me see past what people say, and one to help me think before I speak. Communication is important to control. It is how we meet people, make friends, network, or serve. It is an aspect of my daily life and with the help of my lapis lazuli and blue kyanite I feel protected and confident doing so. Today I paired the Snow Quartz Mini and African Gold Pyrite pendants from my etsy shop. Since I've been under the weather this week, I haven't been using my creative energy as much. Today it felt like my sacral chakra was about to explode with all the creativity I had built up. Quartz is a powerful energy amplifier so I wore it to enhance my mood. Clear Quartz can be dangerous to wear in that way. It will amplify negative moods, negative energies of the physical such as illnesses, or negative energies in the aura. It's hard to know what negative things may happen each day. The African Gold Pyrite helps protect against negative energies. With this and my creativity amplified by the Quartz, I was pretty much set for success. Because this crystal is snow Quartz and contains white as well as Clear Quartz, it carries properties of its own. It helped enhance my meditative state and mental clarity which are both essentials in the work I do. Sneak peek of the pendants I made today that will be added to my shop on Monday! Nothing bad got in the way of my day, I maintained a positive mood. I made three new pendants for my shop. Overall I think the stones worked very well for me today. It's hard to anticipate negative happening during the day without expecting negative to happen. However, negativity is important to be aware of. Ego exists. That is why it is important to wear a crystal that protects against the negative. It helps decrease the way ego affects the one who wears it, reflecting the darkness that tries to influence the aura back out into the world. Shoutout to my adorable neighbor for giving me that amazing rug! Today I wore the sodalite and stillbite available on my etsy shop. I picked these two crystals out to see how they affected the cold I woke up with. I woke up sick today with a pain in my abdomen and a sore throat. I swear I get sick around this time each year which is so frustrating because it's the beginning of summer. So instead of being outside or on my porch, I spent all day curled up in a blanket inside. I put on the Sodalite because it is a stone for the throat chakra. My throat cleared up so nicely after this stone worked through the energy center. It remains a little sore but the sinus pressure is completely gone. I didn't put on the stillbite until later. Stillbite is excellent for physically removing toxins in your body. I decided I might need an extra detox boost for my body so I made some lemon cucumber water. This paired with my stillbite was a great combination. Stillbite is actually a great stone for bringing joy and peace to the wearer as well. I definitely felt the instant pink vibration of joy rush through my heart chakra before anything else. So at least if this stone didn't help remove toxins yet, it put me in a good mood. Felt like a mermaid today in my sea treasure healing jewelry! Today I wore the Abalone Shell and Aquamarine from my etsy shop. First of all, can I express how much I love Abalone?? The colors are absolutely mesmerizing and the texture is so smooth and so oceanic. Those things are enough to take you away to a beachy, calm place. The other thing I can comment on was my level of creativity. I was able to wrap some stones today that I have not been able to wrap in the past. I truly believe my creativity paired with the imaginative logic this shell provided me enhanced my work today. But seriously, how gorgeous are these colors? Aquamarine is another favorite stone of mine because of its reminiscence of the sea. Whenever I wrap an aquamarine stone I always fall deep into my universal source and achieve my flow. I think that is because of its ability to calm and soothe the emotions & mind. I really felt much calmer when wearing this stone today. A lot has been on my mind lately, but this stone helped me maintain a smile on my face and a state of peace. The other great thing about aquamarine is that it allows your ideas to flow out of you without any hardness. This means very honest and understanding communication with no hostility or worry. This aquamarine was inspired by beachy things. I saw ropes, waves, and sand while creating this. One of the dishes I meditate with. It's so hard to find a place to keep your stones so you can keep track of them, sort them, or carry them into the next room. I got this dish for all of those reasons and because my cat kept knocking over my stones (he can't help he likes crystals as much as I do!) Abalone shell dishes are the perfect way to keep your stones together. I have two right now full of different crystals and am working toward getting more. I sort them by properties and the way I use them. They also look super cute on my altar and shelf! Highly recommend this cute way to keep a collection.